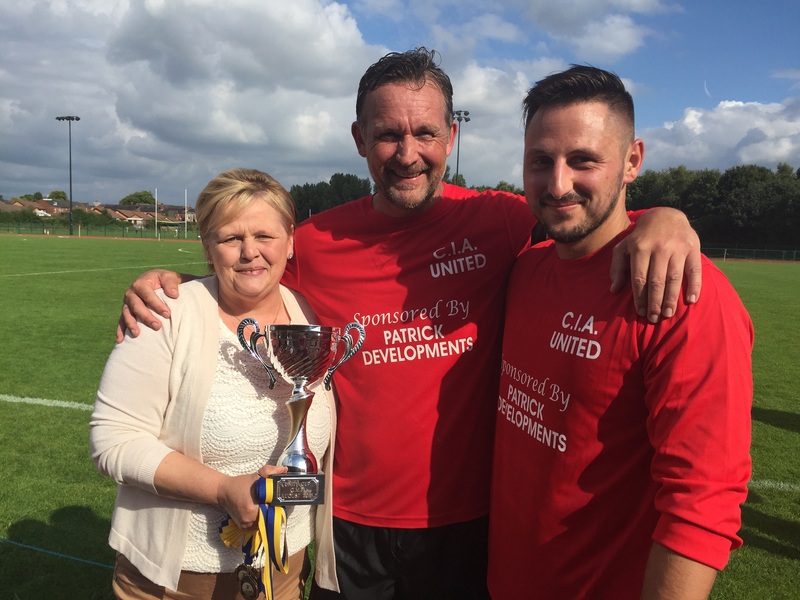 A footballing rematch between Compassion in Action (CIA) and officers from Greater Manchester Police’s (GMP) Wigan Division resulted in victory for our Leigh-based charity’s side after last year’s 14 – 0 defeat. Members of our Recovery Academy, staff and volunteers welcomed Detective Sergeant Dave Whittaker onto their side; together they won 3 – 2 at Leigh Harriers’ home ground on Sunday afternoon. “This match exemplifies exactly what Compassion in Action is all about – uniting our community and leading healthy lifestyles,” says our Chief Executive, Pam Gilligan. “The lads kept their heads held high after last year’s defeat and came back stronger to victory. I could not be prouder of their resilience, teamwork and sporting conduct. The High Sheriff of Greater Manchester – Lady Joy Smith – was Pam’s special guest, along with the Executive Leader of the Council, Lord Peter Smith; Councillor Keith Cunliffe; Trust in Leigh’s Trevor Barton; and Compassion in Action’s latest patron, Leanne Rhead, who was with her family. Monies collected on the day from a raffle will be donated to Lady Smith’s choice of charities and to Cancer Research UK. “Today’s match was another great opportunity to show Pam and the charity my support, and I am delighted to see the lads playing so well!” said Leanne, who has been training for North West Tough Mudder and preparing for a fashion show at The Beeches on 28 September – both in aid of the charity. Detective Sergeant Dave Whittaker presented the winners’ cup to CIA goalscorer Craig Gilligan and ‘Man of the Match’ trophies to his teammate Tom Leyland and GMP’s Rob Donald. Compassion in Action earned the Queen’s Award for Voluntary Service in 2014. On completion of our pathway, each Recovery Academy member will be assisted with accommodation in the community, enrolled on a work placement or employed. For more details on future community events, please telephone 01942 418830 or call in at Patrick House, 58 Leigh Road, Leigh, WN7 1QR.